Wyatt found an able partner in Tamsin Beaumont who played the second fiddle in their 96-run second wicket stand, which took the game away from India. A whirlwind century by opener Danielle Wyatt helped England pull off a record chase and crush India by seven wickets in their second T20 triangular series match. Half-centuries by openers Smriti Mandhana (76 off 40 balls) and Mithali Raj's (53 off 43) balls helped the hosts post a mammoth 198 for four in 20 overs, India's highest score in T20. However, Wyatt's heroics made the chase a walk in the park for the visitors as they romped home with eight balls to spare. The earlier highest chase in women's T20 internationals was also by England, which came against Australia, in Canberra in 2017. Wyatt (124 off 64 balls) made her intentions clear, hitting three fours in the first over. With a flurry of boundaries and sixes, she forged a 61-run opening- wicket stand with Bryony Smith (15). Pacer Jhulan Goswami cleaned up Smith even as the visitors raced to 67/1 in the powerplay. But that did not deter Wyatt, the cynosure of all eyes at the Brabourne Stadium, as she brutally punished a listless Indian attack. The opener spared no bowlers - be it the pacers or spinners - as she completed her fifty in 24 balls and her hundred in 52 balls. This was Wyatt's second T20 international century and it was only befitting that she completed it with a boundary. 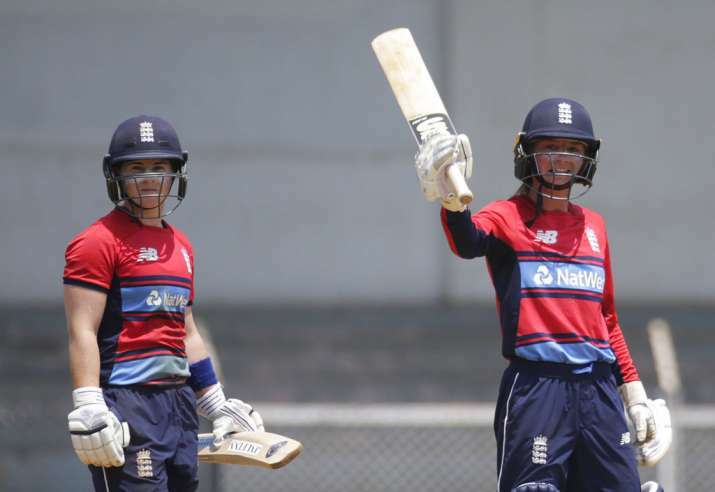 She found an able partner in Tamsin Beaumont (35 off 23 balls) who played the second fiddle in their 96-run second wicket stand, which took the game away from India. In the ninth over, Wyatt punished spinner Poonam Yadav by hitting two sixes and continued the carnage till she departed in the 17th over. Wyatt struck 15 boundaries and five towering sixes in her blistering knock. Indian bowlers leaked runs and lacked intent, the sloppy fielding by the hosts only adding to their misery. After Wyatt fell, Natalie Sciver (12 not out) and Heather Knight (8 not out) took England home with ease. Earlier, Mandhana and Mithali took the English bowlers to task as they stitched a 129-run stand for the first wicket. The two hammered the loose deliveries on a placid track. After a patient first two overs, Mithali built the momentum, hitting two fours off left-arm pacer Tash Farrant in the third over. The left-handed Mandhana took charge from the fourth over. She hit two boundaries and a six off Katie George, as India amassed 20 runs in the over. Mandhana, who hit a brisk 67 in the match against Australia Women, showed her class once again as she hit three fours in the sixth over and the hosts raced to 52 in the powerplay period. The in-form opener did not look back and continued the attack with a flurry of boundaries and completed her half century in just 25 balls. Mithali, who was playing a second fiddle, then decided to up the ante and hit boundaries as India raced to 96 in 10 overs. The two openers compiled their 100-run stand in 61 balls and this was the second century stand between Raj and Mandhana. Mithali, who got a life on 35, capitalised and completed her fifty in 40 balls by hitting seven fours. Mandhana, who posted her highest individual score in T20s and also the fastest fifty by an Indian, dismantled the English attack by hitting 12 fours and two sixes. She was dismissed in the 13th over by Natalie Sciver after being caught by Beaumont. England then made a comeback removing Raj and Veda Krishnamurthy (3) in quick succession. But skipper Harmanpreet Kaur (30 off 22 balls) and a late cameo by Pooja Vastrakar (22 off 10 balls), who hit four boundaries in the last over off Jenny Gunn, who was playing her 100th T20 international, helped the team close in on the 200-run-mark. Brief Scores: India Women (198/4 Smriti Mandhana 76, Mithali Raj 53, Tash Farrant 2-32) in 20 overs lost to England Women (199/3 Danielle Wyatt 124, Tamsim Beaumont 35, Dipti Sharma 2-36 ) by seven wickets in 18.4 overs.